Temperatures are rising in our nearby deserts with current average highs over 100o, so it was time to catch the mountains before they also become too hot for us. 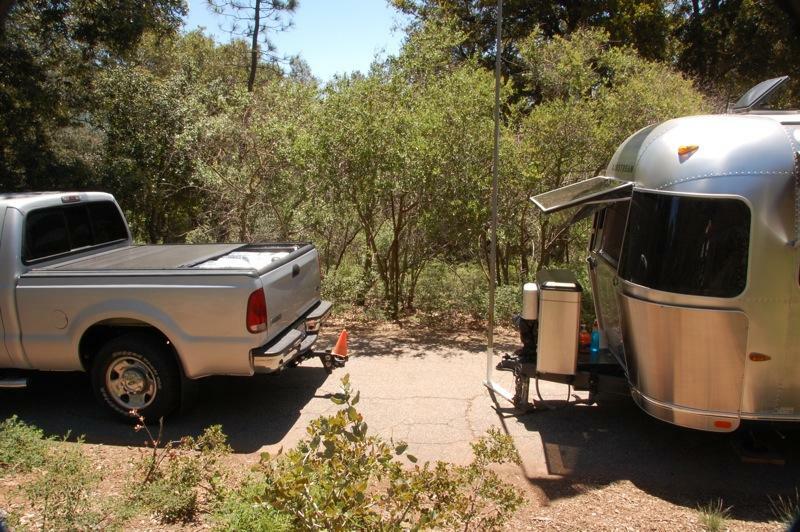 Our F-250 easily towed our 23′ Safari up from the Pacific Coast to our favorite wooded mountain campsite in the Cuyamaca Mountains, near Julian, California, at an elevation of 4200′. Julian, located in a mixed pine-oak woodland, was the seasonal home to the Native American Kumeyaay people, who were displaced after the American Civil War by displaced Confederate Veterans from Georgia. 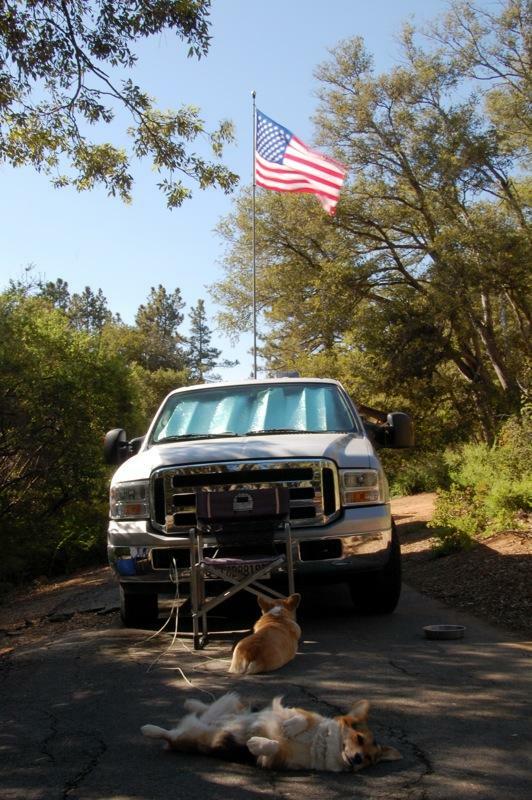 We strategically backed the trailer into the sun for the solar panels and parked the unhitched truck near the shade, where we and the Corgis often relaxed and chilled out during the heat of the day. We raised the American flag high in honor of Flag Day. We bring a large cooler filled with food and ice on every trip, which we usually take out of the truck and place in a shady area. But it periodically had to be moved out of the moving sun or protected from night creatures, such as raccoons in this case. So we found that it is more convenient (and the ice lasts longer) to leave it in the truck cargo area with the Retrax locking cover retracted for ventilation and cover it with a large truck sun shade to keep it cool. Since we had five nights reserved here, I brought along our REI dome tent that I had brought out here two years ago and set it up to relive the joys of tent camping and being close to nature and the elements, at least for a night or two (this might become an annual event). 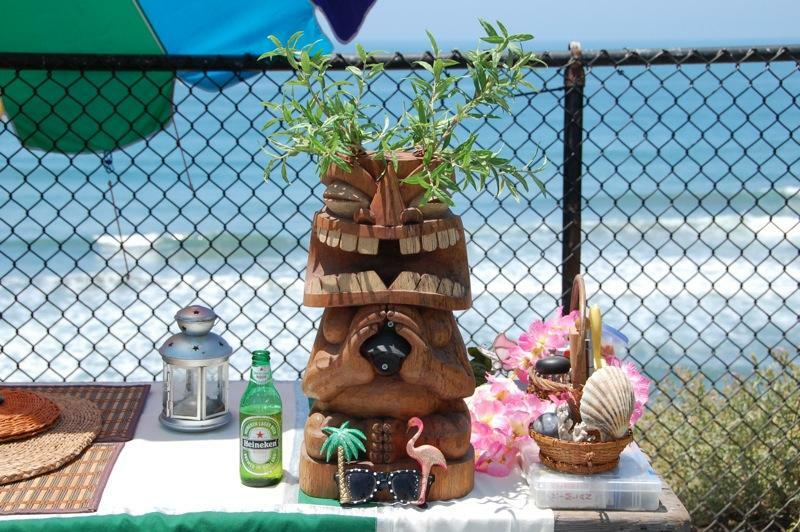 The Tiki, which we renamed “Iz“, also came along to enjoy the elements, especially the sun, which almost always makes him high. 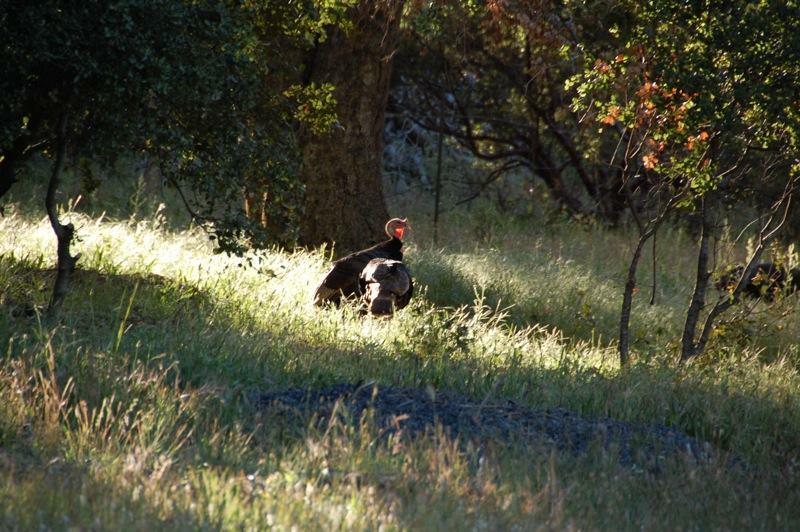 This campground is known for its wild turkeys, and one morning I found one that likes to take a walk in the sun. 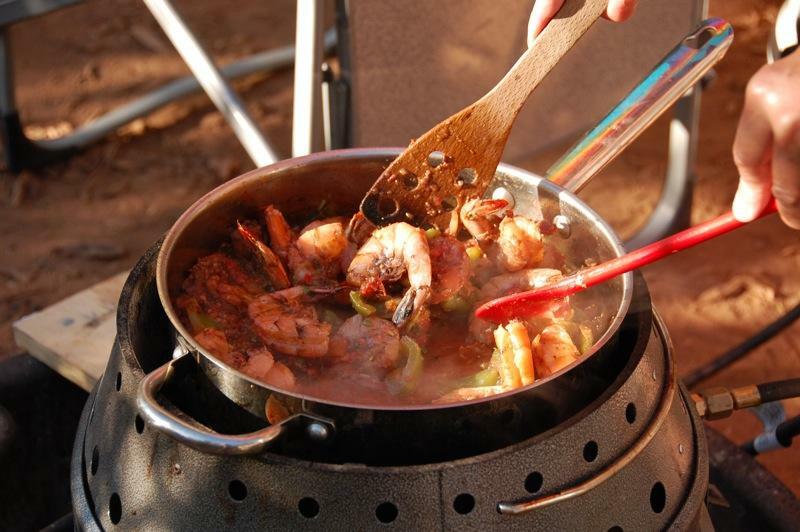 Later in the day, jumbo shrimp, bell peppers, onions, and leftover salsa fresca were stir fried on the Volcano 2 stove using the propane attachment. As the sun set, we sipped Kahlúa in half and half cream in sherry glasses while we were entertained by bats dancing through the sky in search of insects. Tasha and I spent two nights in a row in the dome tent guarded by Iz. 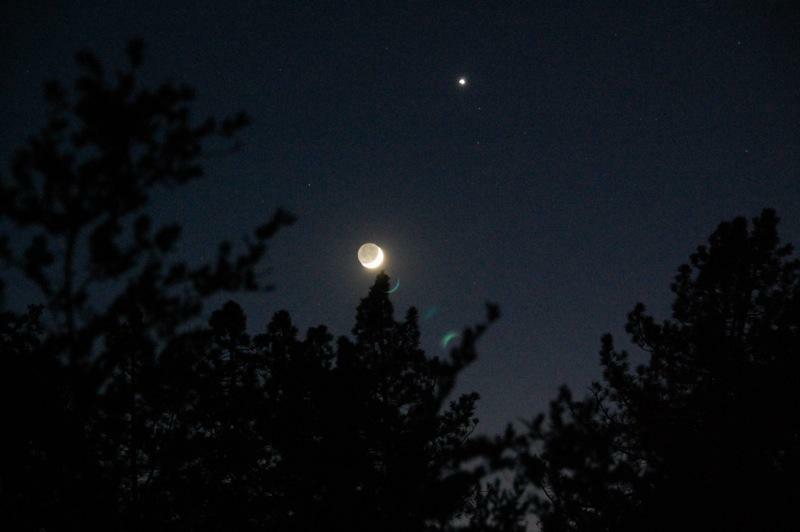 We listened to the evening breezes rustling through the hillside forest trees, sounding like the ocean surf at times, as the first quarter of the Strawberry Moon slowly descended the western night sky. 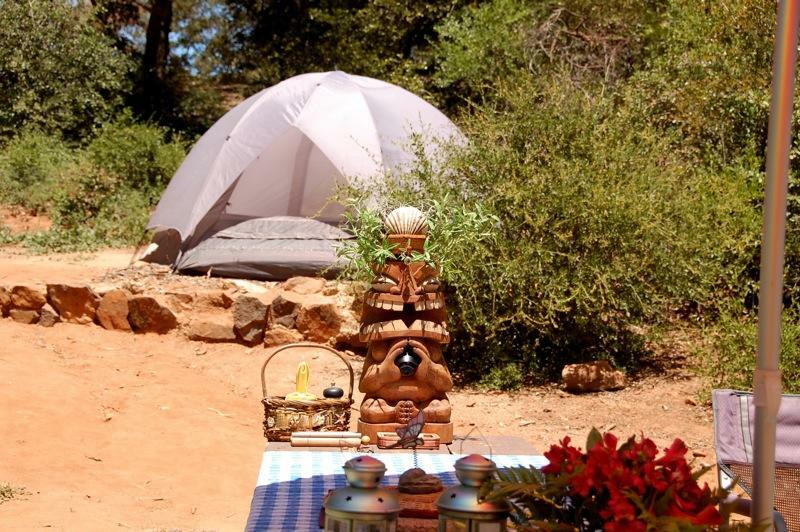 We awoke at first light to the chorus of morning bird songs as our midsummer night’s dreams lingered in our minds. Two years ago my “Sun safety” article discussed the importance of protecting our skin from the harmful effects of the sun by using protective clothing, sunglasses, and sunscreen. I thought I had made a good choice in using a broad-spectrum UVA-UVB sunscreen, with a Sun Protection Factor (SPF) of 30 or higher. But now I am learning that there are many conflicting reports about the effectiveness and safety of sunscreen products. The Environmental Working Group (EWG) released its fourth annual “Sunscreen Guide” last month, which recommends only 39 out of 500 beach and sport sunscreens for this season. According to EWG, many sunscreen products contain red-flag ingredients, like vitamin A (retinyl palmitate) and oxybenzone. The sunscreen that I had been using contained oxybenzone 6% as an active ingredient, so I now use one ofEWG’s top rated sunscreens. 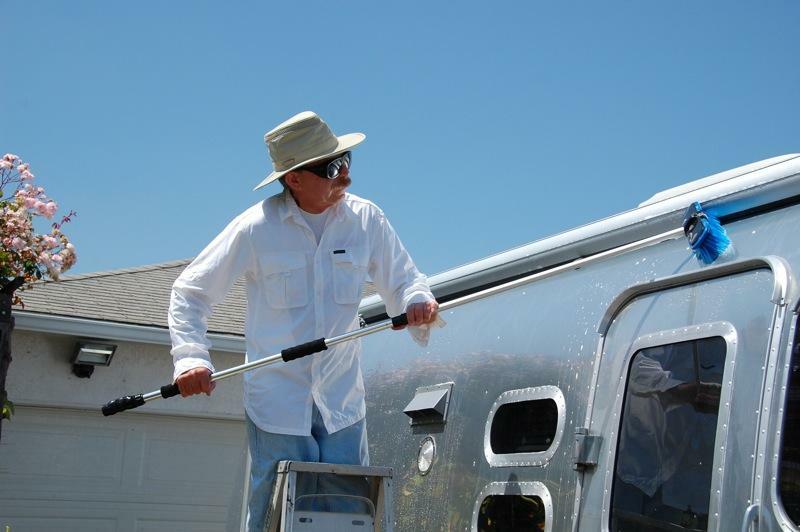 Of course, the best sunscreen is a hat, shirt and a good pair of sunglasses, which I wore while doing our annual big wash and wax job on our trailer, upon our return from the beach last month. 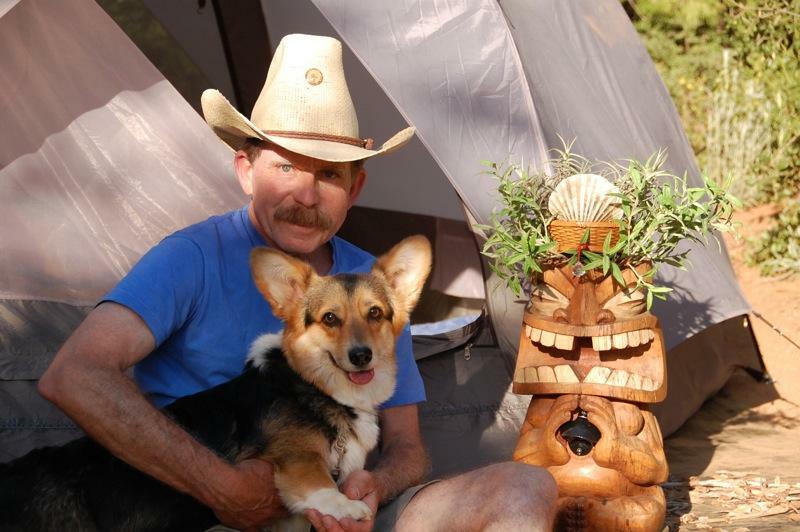 The hat is Tilley’s broadest brim hat, the LTM2 Tilly Airflo Nylamtium Hat. It is comfortable, lightweight, and comes with a tuck-away Wind Cord. 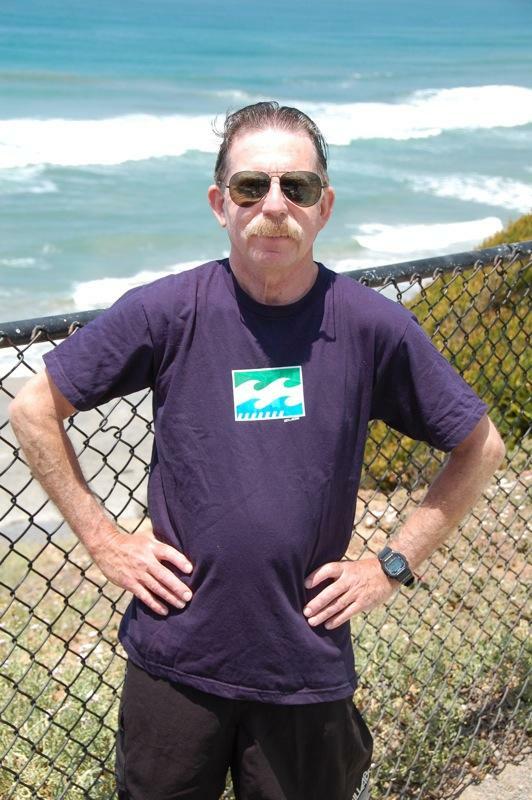 The white shirt is Silver Ridge II by Columbia Sportswear Company. It is lightweight, comfortable and super-ventilated. My extra-large SolarShield sunglasses are comfortable while providing Advanced UV Protection (and can fit over Rx glasses). These items always travel with me when camping. EWG points out that their “sunscreen database is dynamic, which means that the sunscreen ranking numbers may change based on evolving science, new information on UVA, UVB radiation and sunscreen ingredients, marketing conditions, or other factors.” Light might be shed on the sunscreen controversy over the effectiveness and safety of sunscreen products if, and when the Food and Drug Administration (FDA) issues sunscreen industry regulations, which they began drafting 32 years ago, according to The Huffington Post. Congresswoman Nita Lowey (D-NY) has called upon the FDA to finalize sunscreen regulations. One of the latest health concerns is the use of nanoparticles of zinc oxide and titanium dioxide in sunscreen products, as discussed in the AOL News article, “More Bad News About Sunscreens: Nanoparticles“. This further underscores the importance and need for the FDA to develop and publish new sunscreen guidelines and regulations. See this excellent YouTube video, “Go Green with Sunscreen“, for tips on staying safe in the sun. Now I think I’m ready for those bright, sunshiny days! According to The Ocean Project, the concept for “World Ocean Day” was first proposed in 1992 by Canada at the United Nations Earth Summit in Rio de Janeiro. Listen to a very moving speech by 12-year old Severn Cullis-Suzuki given at this summit as she presented environmental issues from a youth perspective. 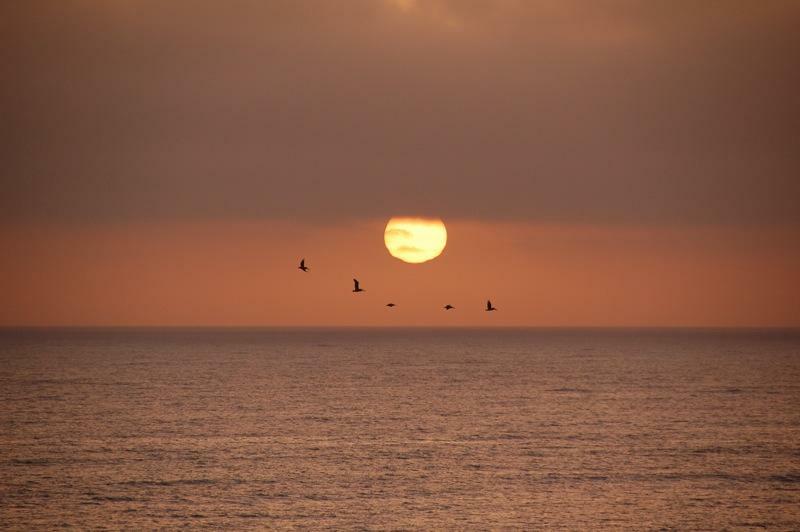 The Ocean Project, working with the World Ocean Network, has been promoting World Oceans Day since 2003. World Oceans Day was officially declared by the United Nations as June 8th each year beginning in 2009. The purpose of World Oceans Day is to raise awareness about the crucial role the ocean has in our lives, inform the public of the dangers threatening the ocean and of the impact of human activities, and to encourage everyone to take action to protect and preserve the ocean and its riches. “Wear Blue and Tell Two” is The Ocean Project’s slogan to encourage people to celebrate the worlds oceans by associating the color blue with the oceans and by taking personal action to help. 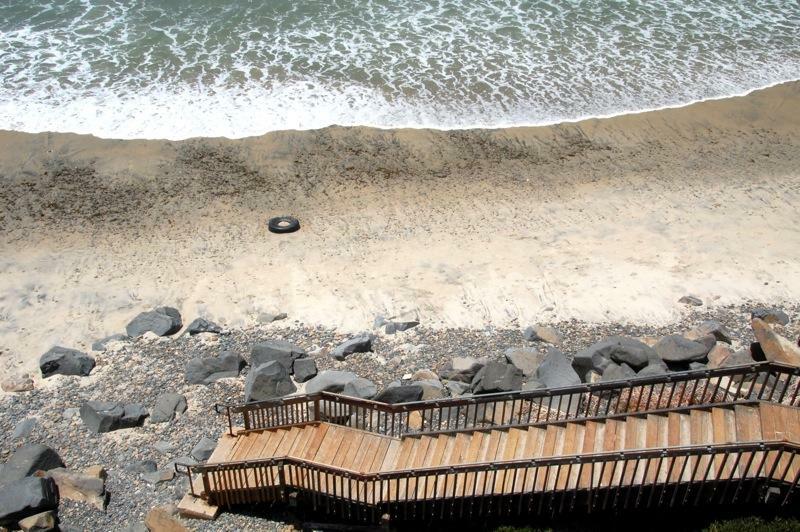 I was aware of this and of the ongoing oil spill in the Gulf of Mexico as we camped above the beach at South Carlsbad State Beach, so I curiously descended the wooden stairway to the beach below with a new perspective. 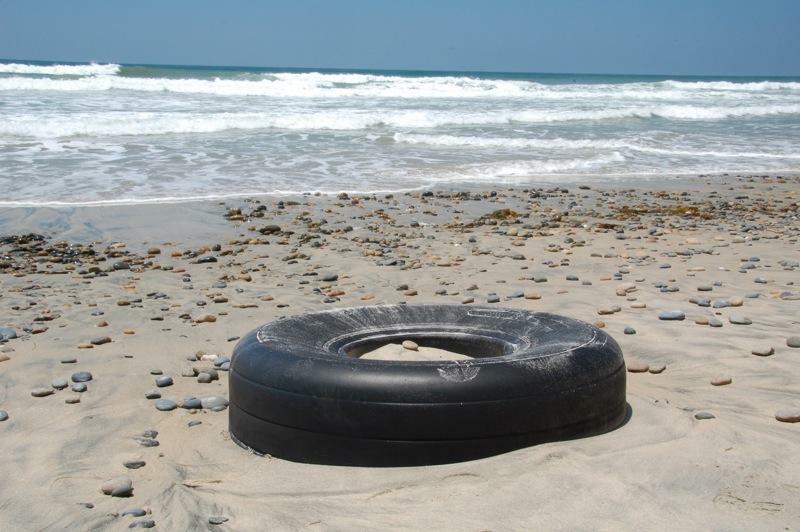 Even before I got down to the beach, I could see something that did not belong there, a tire. Why was this vintage B.F. Goodrich Silvertown tire there? 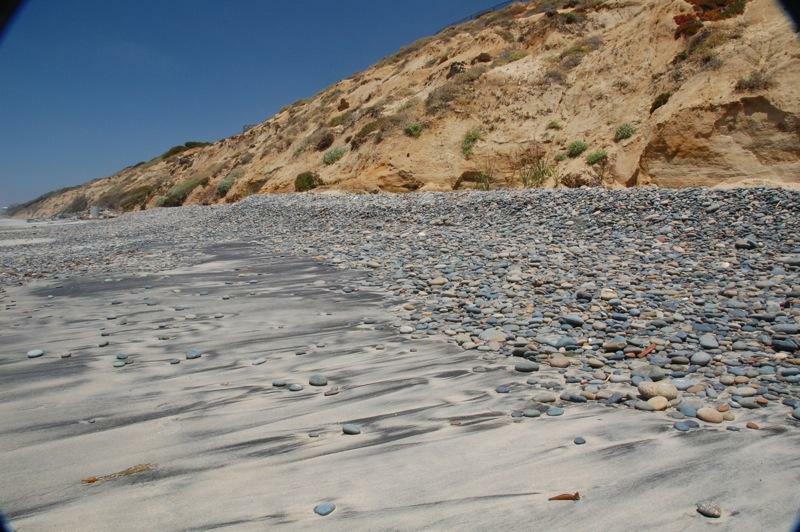 I looked up the beach and noticed that it is losing sand, and Carlsbad’s sand is like gold for the city. 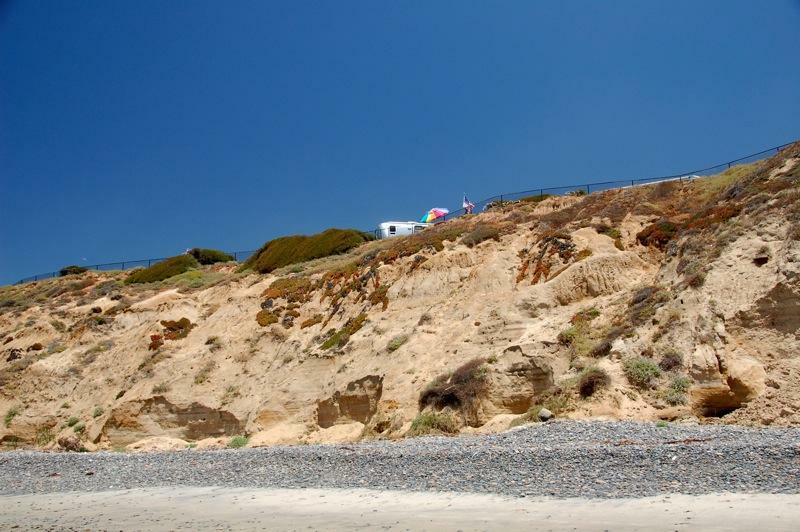 Signs on the bluff warn that the cliffs are unstable. Cliff erosion can be seen below our campsite. As I walked the beach, more questions came to mind, such as why was this snack package here? 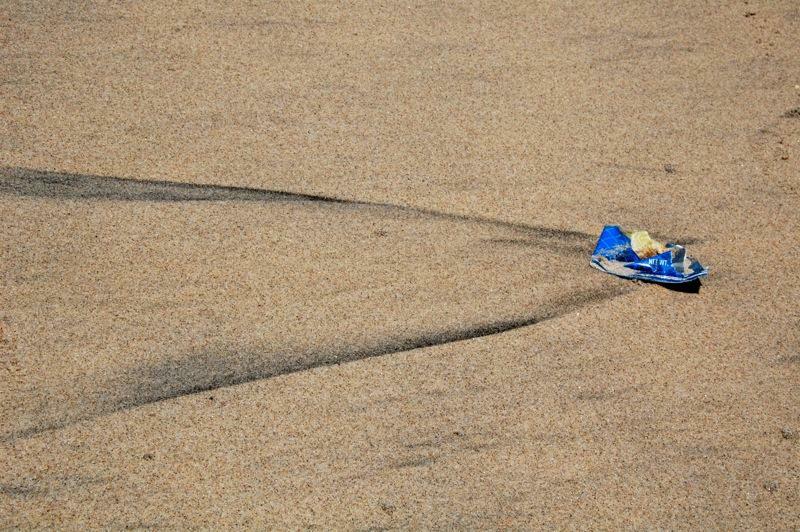 Would the person who carelessly discarded it be strolling here if everyone else did the same and the beach was covered with litter? More questions arose. What comes out of the two large drainage pipes sticking out of the cliff? What killed the plants nearby the pipes? 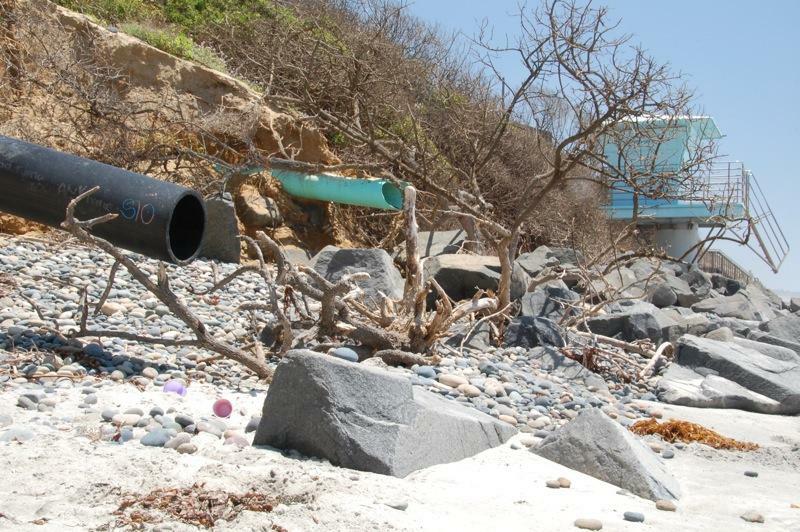 “Think Blue” is the City of San Diego’s campaign to prevent pollution from entering the storm drains, which drain untreated water into our creeks, bays, lagoons, and ultimately, the ocean. 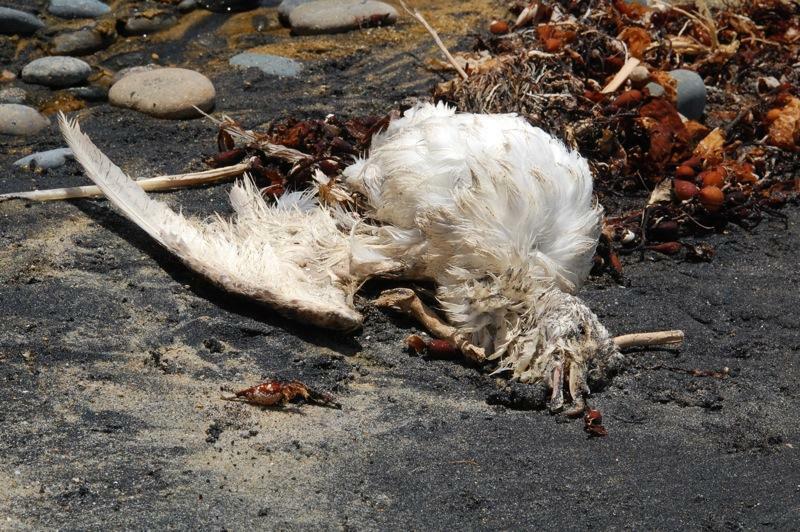 What caused the death of this seagull? This year World Oceans Day falls on a Tuesday, so many events are taking place on the weekend before, June 5th – 6th, such as beach walks and cleanups, tidal pool explorations, aquarium festivities, and readings of One Fish Two Fish Red Fish Blue Fish, by Dr. Seuss. Find an event near you here.